On Friday we continued north across more saltbush scrub, desert and gibber lined road stretching on and on eventually disappearing into the horizon. Crossing the into Northern Territory brought about a different landscape. The Buffer grass, so carefully plucked and eradicated strand by strand in South Australia, covered every spare bit of ground. The grass was originally thought to be an effective dust dampener but has proved to be a fire hazard and bullies the other vegetation into submission, recognised by SA conservationists and a source of contention between the two states. Stuart crossed what would become our path on 11th July 1861 and again on July 14th 1862, so he picked the right time of year to travel. We pulled into Kulgera- the first and last roadhouse/pub/fuel in the NT. A sandy, dusty campground with solar showers and no water but serving our purpose well for a couple of nights stop. The Bocce Championship of 2015 commenced with Sue taking out the first night’s competition. Day trip to Lambert’s gravitational centre of Australia. 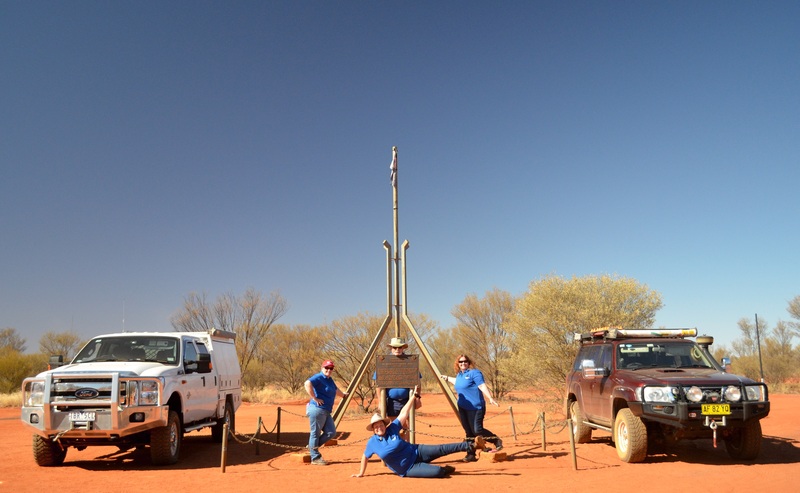 There is a bit of confusion and controversy about the precise location of the centre of Australia and in 1988 the Royal Geographical Society of Australasia decided that the centre is at the Lambert Gravitational Centre – about 142 km NE of Kulgera in the NT. The road from Kulgera is red dirt and was recently graded and the fun came after the turn off. We twisted and turned along a single track of deep sand and deeper corrugations – the rains had taken out parts of the track which almost resulted in a two lane one way system for much of the route – but not the bit where we met a fourby and trailer in tow. Luckily Steve and I both have the ability to drive the trucks at 45 degree angles along the piled sand at the edges. 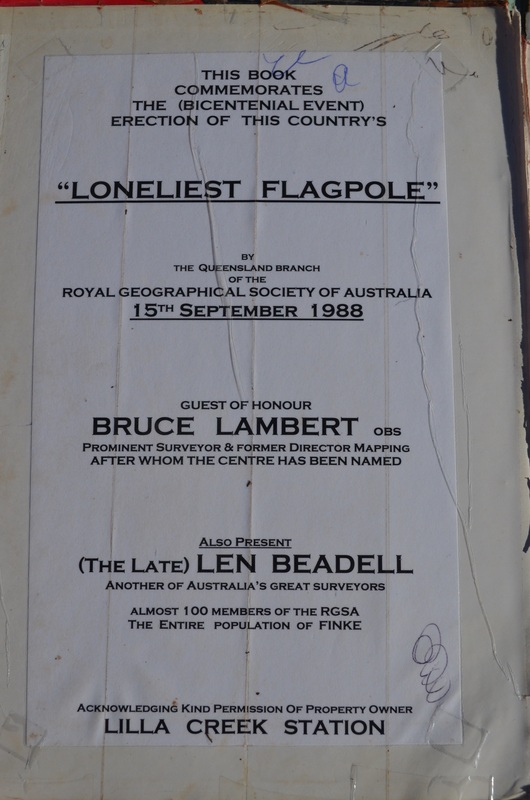 The centre has a flagpole, plague, visitor’s book provided by the Toyota Club ( Victorian Branch) and a long drop toilet. All very handy items in such an isolated location. 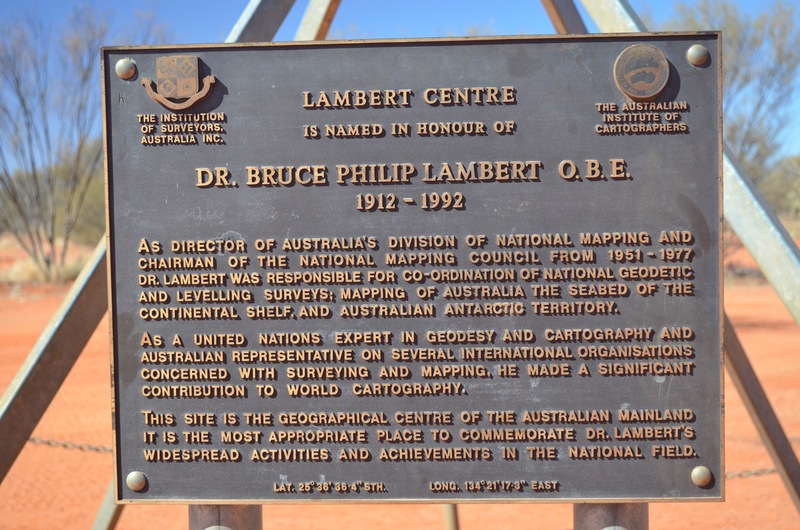 Stuart crossed what is now the Kulgera-Finke Road at a point very close to Lambert’s in his 1860-62 trip. 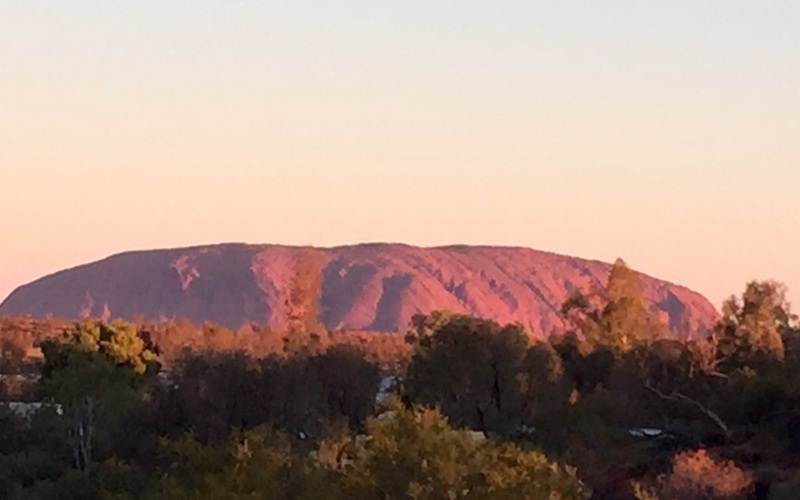 Today we arrived at Yulara and gazed in awe as the sun set on the beautiful, magnificent, powerful Rock. Tomorrow we will get a up close and personal. In the meantime, the roast smells delicious as it cooks itself to perfection in the baby Weber as the sun set on the beautiful, magnificent, powerful Rock. Tomorrow we will get a up close and personal. In the meantime, the roast smells delicious as it cooks itself to perfection in the baby Weber. Enjoying all Blogs as ever, but this one seems to be repeating itself in several paras !!! Too much of the Red at the time of writing !!! !